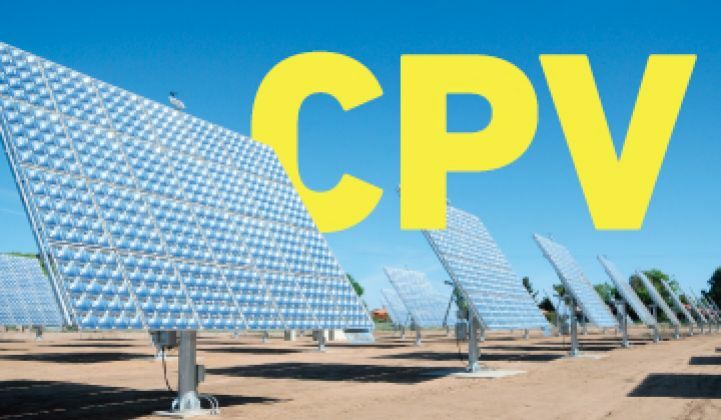 CPV is a niche market—a potential gigawatt-scale niche market. The CPV market is seeing great cause for optimism these days. We've covered recent funding for GreenVolts, Semprius, and Morgan Solar and the positive environmental verdict here. We've also covered new projects from Soitec, Amonix, and SolFocus. One of the leading CPV players, Soitec, has raised a $212 million "capital increase" of which half to two-thirds will be devoted to the CPV efforts of the public firm, according to Hans-Joerg Lerchenmueller of Soitec in a briefing last week at the Intersolar tradeshow in San Francisco. A 150-megawatt project with Tenaska (subject to a loan guarantee). The CPV solar power plant, known as Imperial Solar Energy Center (ISEC) West, will be built on a 1057-acre former farmland site in Southern California’s western Imperial County; completion is targeted in 2015. A 10-megawatt project in Morocco currently under an MOU. 50 megawatts awaiting a PPA in a South African project (Soitec is doing their own project development in this instance.) Lerchenmueller said that there was a shortage of solar developers in South Africa despite its power shortfalls and high DNI. Soitec has already installed 60 kilowatts in South Africa and that project has been delivering performance data for eight months. Of interest to any CPV supplier is the fact that there are two European countries with CPV-specific feed-in tariffs (FITs). According to Lerchenmueller, there are 40 megawatts of CPV-directed FITs in France, subject to competitive bidding, and 200 megawatts of CPV-specific FITs in Italy. Providing those figures remain stable, it looks like CPV companies should be able to capitalize on almost 250 megawatts of European CPV subsidies. Soitec and Amonix are the two CPV players with the largest publicly declared project pipelines. We expect additional CPV funding to be announced shortly. Stay tuned.